The Peterstown TEC Spiritual Core Team represents the heart and soul of TEC, with the Paschal Mystery as its model. Its mission is to listen, discern, and meet the needs of our youth and entire TEC movement by being a prayerful example of commitment, continuity and leadership. This team, which is made of the Program's Lay Director, Spiritual Director, and Assistant Spiritual Directors, guides the community, provides continuing formation on TEC related issues, and encourages continued involvement in the TEC experience and its follow-up. 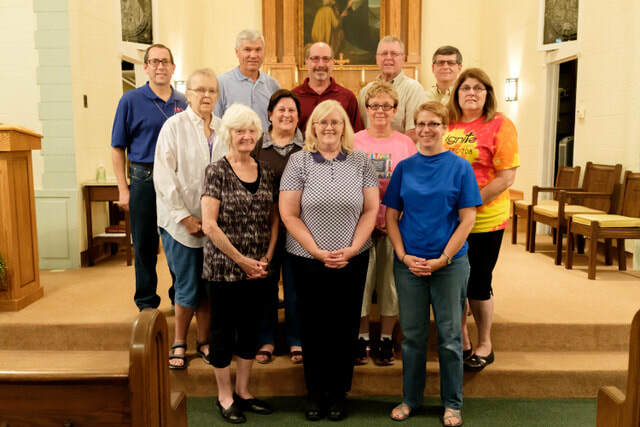 Pictured are (front row from left) Joanne Brown-Oberheide, Brenda Barnickel, Anita Kobilsek, (second row) Betty Wenzel, Mary Kunkel, Jyll Pozzi, Robin Santman, (third row) Kim Santman, Steve Kunkel, Jim Hoscheid, Steve Harmon, and Deacon Dan O’Connor. Not pictured are Colleen Harmon, Phil Grant, and Carol McLachlan. The Assistant Spiritual Directors (ASDs) help guide the Council Chairmen with their various responsibilities that need to be done in preparation for a TEC weekend. The ASDs also guide speakers when preparing talks and set up for para liturgies on TEC weekends. Thank you for doing the extra "wheat" to help the Peterstown TEC Program.